Number 23 Killarney Road, an old Sandhurst farmhouse, was purchased in 1987 and occupied soon after by the new owners. Years of meticulous research went into its reconstruction, in stages. 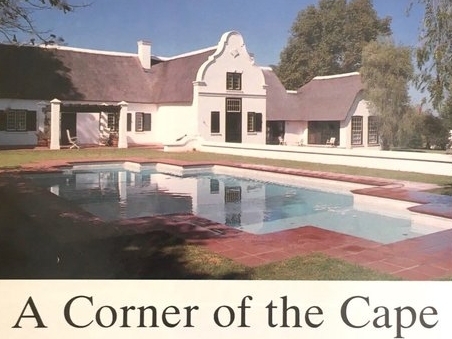 Once finally completed in the early 1990s it was decorated by John Crawley and featured in South African Garden & Home Magazine (November 1992). Although this chapter of its history spans only 30 years, step inside and feel transported to a 17th century Western Cape homestead. Old yellowwood beams and flooring, Batavian floor tiles, traditional brass fittings and metal work were all sourced or commissioned to make the house as authentically Cape Dutch as possible. There's even a story behind the the driveway: eight truck loads of cobbles were fetched from a wine co-op near Du Toit's Kloof! As you enter The Gables you will be drawn to the fireplace and 16th century tiles from the Netherlands, identical to some displayed in the V&A Museum, London. Since 2012, the house has been rented by three different families, and shortly before its latest conversion Andy Scott and her family (and dogs Lucy & Georgina ) enjoyed two and a half years here. Just as we have so many fond memories of the property, we trust that visiting The Gables will be a tranquil and memorable experience. We look forward to welcoming you. Assistant Manager at The Gables. I'm Jessica, co-founder and now director of The Gables. Bit of a Jill-of-all-trades and loving the adventure of life and business! It's an absolute privilege to run The Gables with an amazing team! Meet Evias Ndebele, Clayton Ndazi, Desmond Nleya & Thandi Masiza - our incredibly loyal and trustworthy staff who between them have over 50 years of service at no 23 Killarney Road! Desmond is our property manager, Clayton the assistant manager at The Gables (cafe, events, hospitality), Evias works in our garden and assists in the cafe and Thandi is our barista, assistant chef and housekeeper. We're all up-skilling and growing professionally! Our chef Ingrid is our go-to for fantastic food, bespoke menus and all things catering in the life of The Gables. It's been wonderful to have her on board since March 2018.